This 22 inch pan Serves 7 to 12 people. This pan fits over a 23-inch Weber kettle grill. A stovetop with four closely-spaced burners can usually accommodate it nicely as well, but you'll need to rotate the pan during cooking. It is too large for the oven. 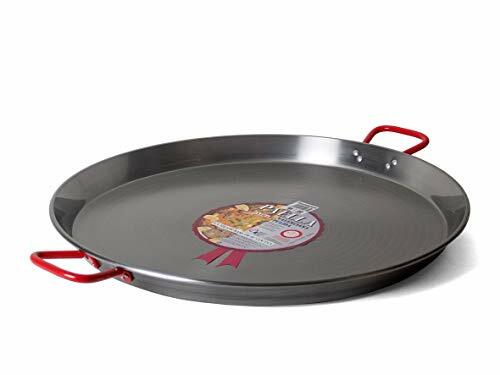 The pan is made of carbon steel (aka polished steel, or acero pulido), which is ideal for paella since it conducts heat quickly and evenly. The handles are made of steel and painted red. The pan is thin but quite rigid and durable, with a hammered dimpled bottom. Carbon steel is the traditional material for paella, and some paella devotees feel that it enhances flavor. Informative pamphlet with each pan, which contains two recipes. Can be used on a gas or charcoal grill, on the stovetop, or in the oven. Carbon steel is durable and conducts heat well. Dry the pan right after washing it and then rub the inside with a little vegetable oil to prevent rusting. If the pan does rust, a few passes with steel wool takes it right off. If you have any questions about this product by La Paella, contact us by completing and submitting the form below. If you are looking for a specif part number, please include it with your message.